Willow Lodge has 3 bedrooms: 1 double with TV, en-suite bathroom with bath, hand-held shower and WC and a door to the balcony , 1 twin bedroom and a separate WC. The third bedroom downstairs has full sized bunk beds (on request the top bunk can be removed to create a single room). Opposite this bedroom is a bathroom with a large walk in shower and WC. There is a utility area with a washing machine, tumble dryer and plenty of room for coats. Open-plan lounge/kitchen/diner. The kitchen has an electric cooker, microwave, fridge and dishwasher. Lounge with a TV, SkyTV, DVD and hi-fi. 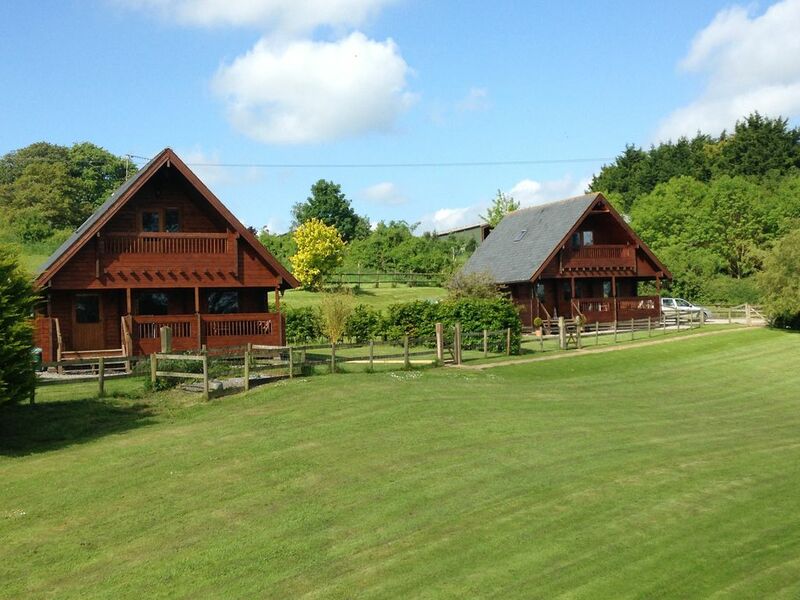 Whistley Farm Offers 2 beautifully appointed lodges. Outside both lodges there is a veranda with seating and BBQ. The gardens immediately in front of the lodges is fully enclosed so children can play safely. Private entrance with ample off-road parking. Bed linen, towels and electricity are included. Only a few miles from Shaftesbury in Dorset with the famous ‘Hovis’ Gold Hill and Longleat Safari Park and Stourhead House in Wiltshire; you will be spoilt for choice whether to sightsee or just relax in the beautiful surroundings. We are a family run Farm and the fourth generation to farm here,we live on the farm with our two sons Adam & Ben our dog Boris & horses Fire Moon Spyder & Pops, plus chickens Hazel Hebe Hattie & Hennie who will provide you with wonderful free range eggs. We diversified into Holiday accommodation in 2006 & we are 4 Star rated by Visit Britain Kelpers Barn is 4 star Gold Rated. Our farm consists of mixed crops with our main crop being haylage & hay, which if you come during the summer months you can see being made in the fields nearby. Whistley Farm is set in a quiet peaceful rural location, surrounded by stunning countryside,where you will see an abundance of wildlife. Safe enclosed private garden , with sun loungers , picnic table and outside table with seating for 6. Outside: Both Lodges have large secure gardens,the fencing is approximately 1m in height. They both have balcony's & verandas, which have outdoor furniture & BBQs. The Lodges overlook and have access to a large area of lawn, which has a 4 hole pitch & putt golf course, & plenty of room for outdoor activities, adjacent to this area there is a well stocked lake which is suitable for coarse fishing exclusively for guests. Did not want to leave. Was heaven! Property very clean . Owners very friendly and approachable . We wanted for nothing as all is supplied . Wonderful walks from the lodge . We had everything we needed, beautiful views and lovely things to do in the area. The owners were very friendly and welcoming. Bournemouth Pool & Sandbanks beaches are approx 33 miles away. Bournemouth & Bristol airport are within an hours drive. Gillingham has a Train station with a direct line to London ( Gillingham is approx 3 miles from Whistley Farm. The village of Milton on Stour is 1 mile away, Gillingham town is 3 miles & Shaftesbury is 8 miles. Stourhead House & Gardens 4 miles. Gillingham has a Waitrose, Asda & Lidyls supermarkets. Shaftesbury has a Tesco supermarket. Booking Notes: Our terms and conditions can be found on our website www.whistleyfarm.com Changeover Day: Changeover Day is Saturday, arrival time is 3pm and departure time is 10am (unless otherwise agreed) Short breaks may be able to have a later check out time , please call us on 01747 840962. Notes on prices: We may be able to accommodate short breaks ,minimum of 2 nights during low season (November through to March) please contact us for information. Fishing is available at £25 pp per week or £5 pp per day.